what a beautiful picture ~ the promise of spring! And the speaking like Yoda? I keep singing “Spring, Spring, Spring” from Seven Brides for Seven Brothers, but unfortunately I don’t know any of the words apart from the “spring”s. Spring IS coming to the Highlands; YA!! Love those Crocus. 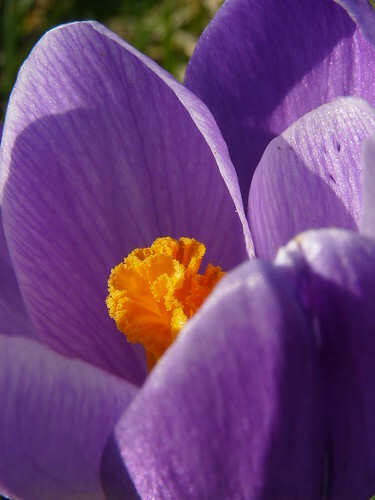 The crocus are just beautiful…especially the purple one! Ah, crocus.. While I love them, they always get my hopes up a couple of weeks too early. Walking through the Meadows in Edinburgh there will suddenly be hundreds of these little beauties in the last days of February or early days of March; normally accompanied by a few days of sunshine and temperatures exceeding 10 degrees. Yay! nearly summer, I think, and this year has been on exception. Unfortunately the weather gods didn’t forget to arrange for a bit of disappointment to go with the joy, though, and today I woke up to SNOW. Ah well, at least it’s not as bad as last year (well, yet, anyway) – we got about an inch in an hour or so on the 30th of March, while all dressed up and celebrating the Mrs’ birthday in a fancy restaurant. We ended up having the place (and the drunk waiter) to ourselves, and staying for rather longer than intended. I really didn’t need to have “Spring , spring spring” a là Jingle Bells popped , irremovably , into my head . But there it now is , jingling away ! The power of blogging !! Correct me if I am wrong, the crocus provides saffron!